The laser marking machine is a permanent marker with a laser beam on the surface of a variety of different substances. 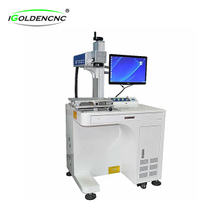 The effect of marking is through the evaporation of surface matter to reveal deep matter, so as to carve out exquisite patterns, trademarks and text, laser marking machine is mainly divided into, CO2 laser marking machine, semiconductor laser marking machine, optical fiber laser marking machine and YAG laser marking machine, laser marking machine is mainly used in some more granular requirements, higher precision occasions. Applied to electronic components, integrated circuits (ICS), electrical appliances, mobile phone communications, hardware products, tool accessories, precision equipment, spectacle clocks, jewelry jewelry, auto parts, plastic keys, building materials, PVC pipe.